Commedia dell'arte is the comedy of the profession was an early form of professional theatre, originating from Italy, that was popular in Europe from the 16th through the 18th century. Commedia dell'arte also is known as commedia alla maschera, commedia improvviso, and commedia dell'arte all'improvviso. Commedia is a form of theatre characterized by masked "types" which began in Italy in the 16th century and was responsible for the advent of actresses and improvised performances based on sketches or scenarios. Characters' entrances and exits are scripted. A special characteristic of commedia dell'arte are the lazzi. A lazzo is a joke or "something foolish" or "witty". 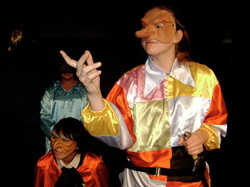 Another characteristic of commedia dell'arte is pantomime, which is mostly used by the character Arlecchino. ​This work is licensed under a Creative Commons Attribution-ShareAlike 3.0 Unported License. Grantham, B. (2000) Playing Commedia, Nick Hern Books, London. Grantham, B. (2006) Commedia Plays: Scenarios – Scripts – Lazzi, Nick Hern Books, London, 2006. 001). Tony, K. (2010) Teaching Commedia dell'arte - A step by step handbook for the theatre ensemble and Drama teacher. Rudlin, J. Commedia dell'arte: An Actor's Handbook. Ebook Corporation.